In order to infiltrate the Nighthawks and find their leader, Blue Blooded Sir Jasper Lynch, Rosalind will pose as their secretary. A dangerous mission, but Rosalind is also the elusive Mercury, a leader in the humanist movement. But she doesn't count on Lynch being such a dangerously charismatic man, challenging her at every turn, forcing her to re-evaluate everything she knows about the enemy. He could be her most dangerous nemesis-or the ally she never dreamed existed. A stunning, action-filled paranormal romance, Bec McMaster's London Steampunk novels will appeal to fans of Gail Carriger, Kristen Callihan's Darkest London series, and the Blud series by Delilah Dawson. 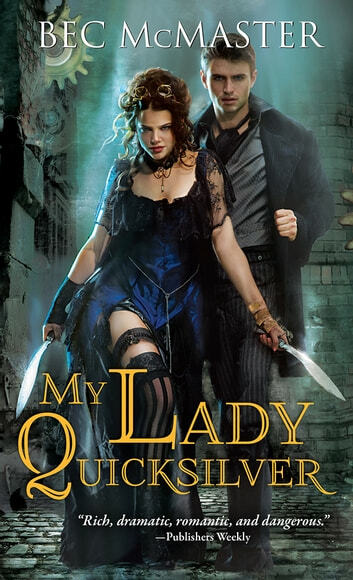 My Lady Quicksilver, Book 3  Rosalind risks her life, and her heart, to get close to the one man who could find and free her brother. But will he? "twists and turns, vampires, revenge, passion, suspense and romance"
"If you enjoy Steampunk, romance and paranormal romance than you are in for a real treat." "Full of action and intrigue, this story is perfect!" "humor and red hot romance"
This was totally steam punk meets Mr. And Mrs. Smith on steroids! Different from the first two books, in this we find two protagonists that are equal in skill and badass-ness. Rosalind and Lynch are the perfect enemies which only fuels the fact that they are also the most perfect of lovers. The story was less about the mystery and solving a puzzle like the first two--you are aware of each player's secrets and you figure out the course of the plot very quickly. The meat of the story this time around is the tension between Lunch and Mercury and the back and worth of these two giants. Neither is weak in character and both play a game where the only result is that both lose. I loved the witty banter between the two and the tension of two worlds being thrust together. Can't wait for the next book. I love this series. Once I start reading, I don't want to put it down. I highly recommend this series. Bec McMaster is a wonderful writer who keeps the reader mesmerized.